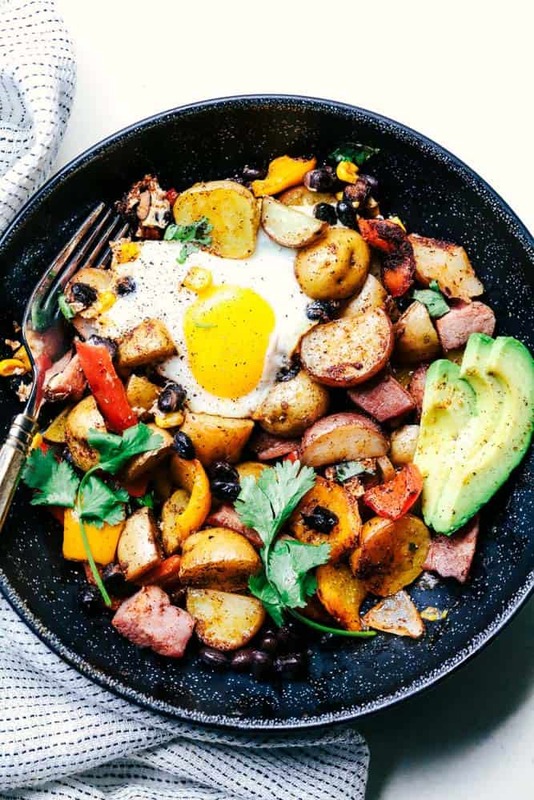 Southwest Baked Ham and Eggs Potato Hash is a fabulous breakfast made all in one pan. 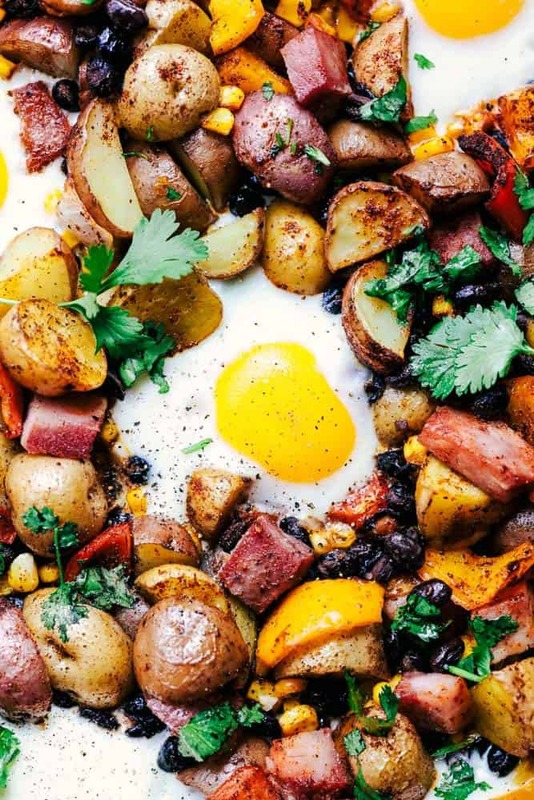 Crispy potatoes, ham, peppers, black beans, and corn all surround a perfectly baked egg. This is a hearty flavorful breakfast that the family will love! Easter is quickly approaching and I have a fantastic brunch recipe for you to add to your day. Between attending church, Easter egg baskets, and visiting family, the day can get quite busy. This year, you don’t need to settle for pancakes and eggs. The McCormick kitchens has you covered with easy, tasty, and colorful meal ideas to brighten up your table. When it gets busy around our house I love the simplicity of making a meal in one sheet pan. If you have not jumped on the one sheet pan bandwagon by now, it is time! 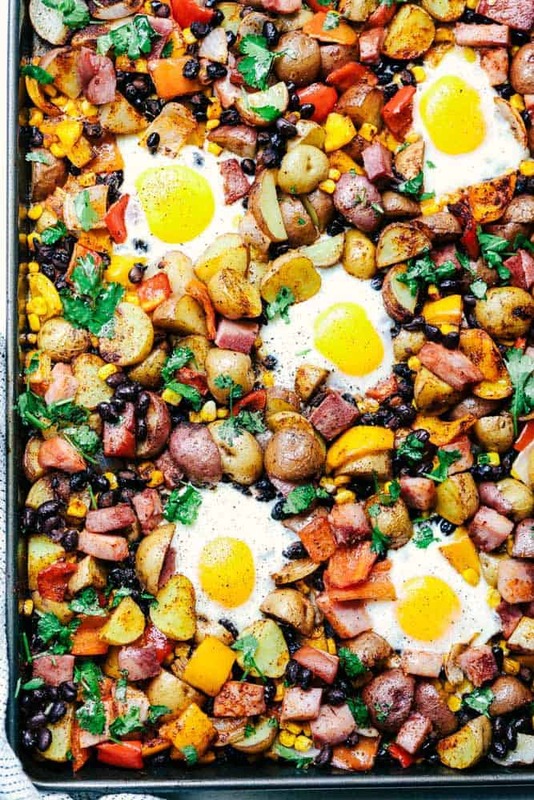 This meal provides all of the essential hearty and delicious breakfast items made all in one sheet pan. We all love meals with big, bold flavor. McCormick delivers once again with their quality spices in this meal bringing delicious southwest flavor. Chili powder, cumin, and paprika take the flavor in this meal to the next level. It seasons the potatoes, ham, peppers, black beans and corn to perfection. Roasting vegetables is my favorite way to prepare them. They get that crispy edge and soft and tender center. 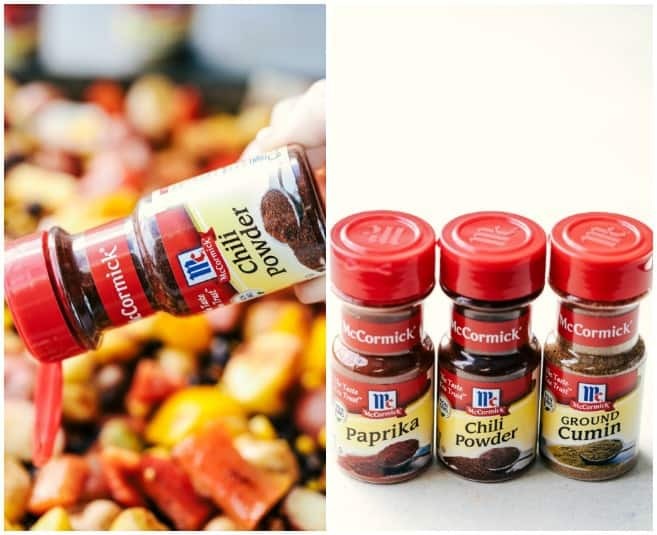 When you add delicious spices to the mix it makes them even better! As soon as they are almost done roasting you crack the egg right into the pan! It cooks all together and makes a beautiful and bright presentation on your dinner table. This year you don’t have to settle for a boring traditional breakfast for Easter! 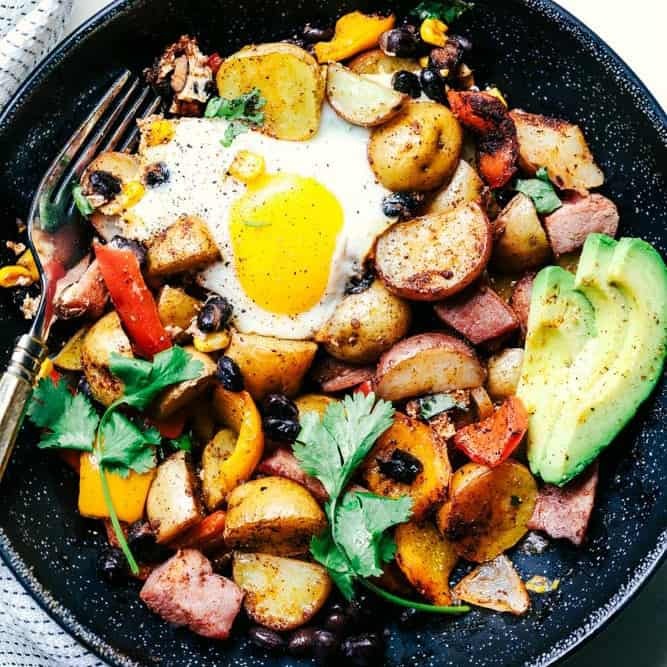 Brighten up your dinner table with this fabulous brunch recipe that is hearty and full of big southwest flavor. Your entire family will love this easy sheet pan meal so much that you will make it all year long! For more delicious recipe ideas like Overnight Lemon Blueberry Muffin Casserole, Baked Eggs and Sweet Potato Hash, Chick Cupcakes, Carrot Cake Shaped Waffles, be sure to visit McCormick.com! Preheat oven to 425 degrees. Coat a baking sheet with cooking spray. Place the potatoes, bell pepper, corn, black beans, and onion on the baking sheet. Drizzle with olive oil and add the chili seasoning, cumin and paprika. Toss to coat and season with salt and pepper. Bake for 15 minutes. Remove pan and add the ham and stir the veggies. Bake for an additional 10 minutes or until potatoes are tender. Remove from oven. Create 5 wells in the vegetables. Gently crack an egg in each. Return the pan to the oven and bake for an additional 5-10 minutes or until eggs are to desired doneness. Garnish with chopped cilantro and sliced avocado and serve immediately. Gorgeous breakfast! I love that dish too, it looks great. I love that dish too, it looks great. 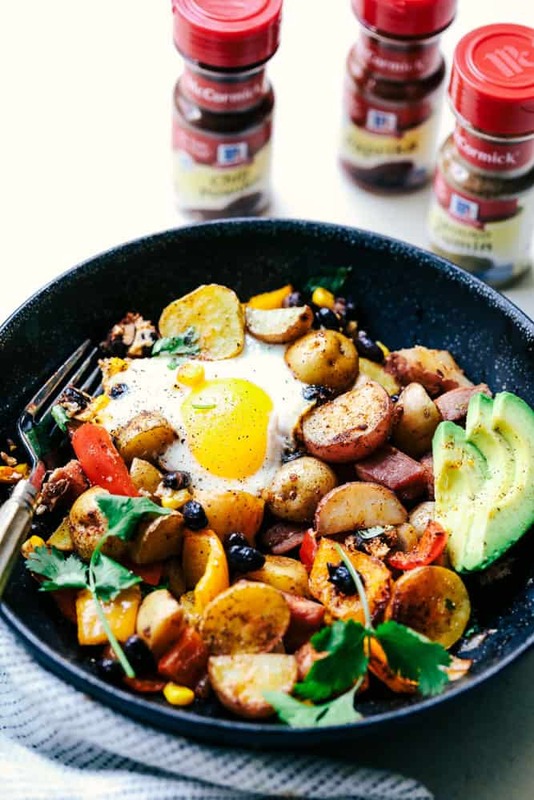 this is beautiful, I love spicy too, so this is perfect for me and love how you spread the eggs around in their own little islands of vegetables! I will try this dish later. BTW it looks very delicious. Thanks for the comment. I know you will love it! Let me know what you think!